Had an amazing stay. Staff was willing to help, got some great advice. Nothing to complain here. Will definitely be back! Absolutely loved the atmosphere in this hostel. We met a bunch of new people and had so much fun during our 4-nights stay. Staff is friendly and they organize pub crawls and free dinners. Beds are very comfy and private because of the curtains. Showers could be a little bit cleaner but I didn't have any problems with that. Would 100/100 stay here again! Very lovely staff, who always wants to help you! Nice rooms. It's clean. The atmosphere is very cosy. 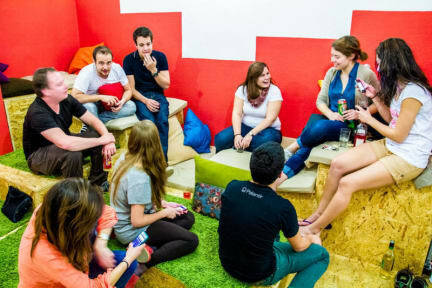 The hostel has all facilities that you need for a great time in Budapest! Definitely will be back! Had an amazing stay in Budapest. 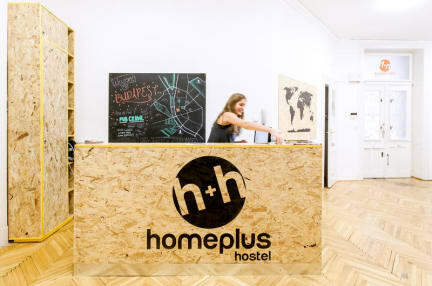 The location, atmosphere and the general feel of the hostel made my stay almost too short. Everything is at walking distance and the night tram almost stops at the front door. The rooms were a bit small and I thought having only two showers for several rooms would have been a problem but I never had to wait. Stayed for one night, beautiful building and beautiful location. Staff was very helpful and kind. Breakfast included but the milk was warm and the bread rotten. Also the dorm was very small, there was too little space to walk. Would not go here again, but was doable to crash for one night. The hostel is very close to the Parlementbuilding. You can lock your dorm room and get your own big lockers where you can store your backpack and valuables. There's a shower and two bathrooms (toilets), a small kitchen and a common area. I wouldn't stay here too long, max 2 days and then it's fine. The staff is really helpfull and professional. She knew here way around and acted very professionally. About the properness I wouldn't be to demanding. Good hostel for this price. The hostel was not so clean, showers were dirty and there was no hot water. Also no AC in the rooms.. the staff was nice and helpful but overal it was ok! HomePlus was oké, maar daar houd het dan ook bij op. Onze kamergenoten waren gelukkig heel gezellig, maar het personeel keek ons telkens raar aan als we een vraag stelden en het was alsof het een enorme inspanning was om onze vragen over het centrum of het openbaar vervoer te beantwoorden. Ontbijt zit er gratis bij, maar na de eerste dag hebben we zelf maar ergens een broodje gehaald omdat het er zo vies uitzag. Locatie is wel top, maar ik zou hier niet terug naartoe gaan.